A beautiful yet practical kitchen tool used to grind dry spices and herbs. These bowls fit comfortably in the hand and are great for creating small batches of blended spice. 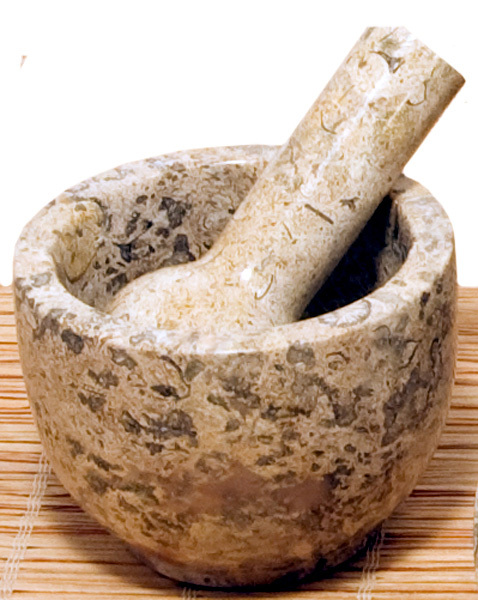 Small mortar and pestle sets make excellent gifts for the cook, those who love to cook or barbecue, can season meat and vegetables with their own unique blends. These unique stoneware pieces, exquisitely hand-crafted from single pieces of metamorphic marble, are from Balochistan Province in Western Pakistan. Skilled artisans turn solid stone blocks on lathes to create beautiful bowls, plates and other stoneware to support their family and community. Marble is recrystalized limestone formed through changes in the earth's heat and pressure. Fossil marble blends natural earth tones with small fossils. The beautiful polishedÊ surface of natural stoneware will stay shiny though the grinding surfaces will dull over time. We recommend cleaning with a damp cloth. No microwave ovens, dishwashers, or chemical detergents please!